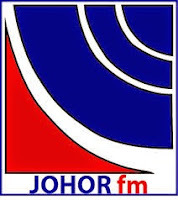 Johor FM, formerly known as Radio Malaysia Johor and Radio 3 Johor Bahru is a Johor state radio operated by Radio Televisyen Malaysia out of the Johor state capital Johor Bahru in Malaysia. It broadcasts in Malay and features local news and Malaysian music, 18-hours a day from 06:00 to 00:00 MST. Johor FM was one of the first regional radio stations in Malaysia. FM 101.9 MHz from Gunung Pulai transmitter site covering South Johor, Riau Islands Province (Indonesia), Singapore and Batam Island. FM 92.1 MHz from Bukit Tinggi transmitter site covering East Johor. FM 105.3 MHz from Gunung Ledang transmitter site covering Muar, Tangkak, Segamat, Batu Pahat in North Johor, Jasin Town and Nyalas in Malacca, parts of Negeri Sembilan (Tampin, Kota, Gemencheh, Air Kurning Selatan and Gemas) as well as Bandar Tun Abdul Razak and Bandar Muadzam Shah in Pahang . AM 1053 kHz in East Johor. AM 576 kHz in South Johor, Riau Islands Province (Indonesia) and Singapore.